Marrying a vampire definitely doesn’t fit into Jessica’s senior year “Get-A-Life” plan. Enter a bizarre new exchange student named Lucius Vladescu who claims Jessica is a Romanian vampire princess by birth and he’s her long-lost fiancé. He’s arrogant, officious, embarrassingly overprotective, and, well, incredibly hot. Armed with a copy of Growing Up Undead: A Teen Vampire’s Guide to Dating, Health, and Emotions, Jessica tried to imagine the transition from an average American teenager to a glam European vampire princess. But just when things start to heat up with Lucius, a devious cheerleader soon sets her sights on him. Soon Jess finds herself fighting to win back her wayward prince, stop a global vampire war—and save Lucius’s soul from eternal damnation. All of which leaves her to wonder: Wouldn’t life be easier if she could just fall for a nice mortal boy? Beth Fantaskey has created a thrill ride full of action, teen angst and unrequited love (is there any better love?). The writing style was phenomenal, as was the plot overall. The entire time I was biting my nails and flipping the pages to see what happened next. This novel was both dark and heavy, yet at the same time light and at times a very fun read. Characters are my focal point for me when I read, and can make or break a book for me. The characters in this novel were spectacular, so realistic and decidedly their own. Jessica reminded me a lot of myself, so I related to her easily. She was methodical and logical, but still very emotional and heart-driven. She also wasn’t boy-crazy. Well, she was, but she wasn’t throwing herself all over Lucius. In fact, she was pushing him away most of the time. At the end, she steps into shoes that she never knew she had to fill, and takes on a duty completely foreign to her. Jessica is definitely a top-notch heroine. And of course, this novel wouldn’t be what it was without the devilishly handsome vampire prince—Lucius. He was everything a girl could love, and more: charming, thoughtful, flattering, and an all around gentleman. But he was far from perfect. He fought with his own inner-demons as well as with abuse and trauma from his own family and upbringing. This all affected him when it came to being with Jessica. They are bitter sweet together, but definitely meant to be. The writing was very well done. I LOVED how we got to read Lucius’s letters to his uncle. This gave me a much deeper insight into Luc as a character, and helped me decipher him a little bit easier. It added a good respite from the action, while keeping us entertained. Jessica’s Guide to Dating on the Dark Side is a definite must read! It also was only supposed to be a standalone, but I guess there was such a big clamor for a sequel, that now there will be one! Woo! I’m excited! 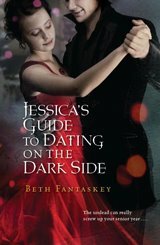 I interviewed Beth Fantaskey about Jessica's Guide to Dating on the Dark Side. You can read it HERE! Great review! I really want to read this book but I have so much other stuff to read first. Great review! I loved this book! It's one of my favourites, I can't wait for the sequel! The book is really very interesting and covers all the facts related to dating.. I am glad I visited here and come to know about such a great resource.. Thanks for sharing.. I read this book a while ago and for a very long time it was on of my top 5 favorite books. It's still one of my favorite books, but well, there are A LOT of books out there. I'm really glad you liked it. :) Great review.